Continuing on our road trip, we took the Lincoln Highway (Highway 30) to Cozad, then a county road north to Callaway. Obviously a relic of the Lincoln Highway on East 8th Street in Cozad. There are many ways to get to Callaway, and all of them scenic. Choices include county roads north out of Gothenburg and Cozad, Highway 21 to Highway 40 out of Lexington, and going from Highway 83 on Highway 92 through Arnold, then south along county roads to Callaway. For being a small town in the middle of the Nebraska Sandhills, and overshadowed by its larger neighbor to the northeast, Broken Bow, Callaway is a happening little town. We parked next to the Morgan park, where the original Custer County courthouse is on display. One of the darkest periods of Nebraska history - the Cattlemen/Homesteader wars played out in Custer County, and the trial of the perpetrators took place right here in this building. Nearby is a swimming pool, playground and tennis courts. Across the street is the Callaway District Hospital, with an emergency room - definitely not something you see in every small Nebraska town. Callaway's Seven Valleys Museum (There's even an annex across the street!). You can check out Callaway's illustrious history on the University of Nebraska website. Sadly... it's not open very often - however the view through the door seems like it's interesting. A very helpful sign on the outside shows the local places of interest. A short walk took us downtown. We were disappointed that the "Seven Valleys Museum" (and its annex!) are only open by appointment during much of the year. Though we peeked in the door and it looked extremely interesting, we didn't take the time to call anyone to open up for us. It looks like it would be worth calling ahead for an appointment. A downtown worthy of an area trading center. Another view of the historic buildings in downtown Callaway. A relic in front of their light plant. Mark insists that this wheel indeed weighs 7020 lbs, though I don't believe him. We made a quick stop at the Callaway Market to pick up a few supplies, and enjoyed the "mini park". There is also a mercantile (looks like a former drug store turned second-hand shop) and a True Value on their main street. There is a pharmacy attached to their little hospital. Further on down the street - a phone booth! 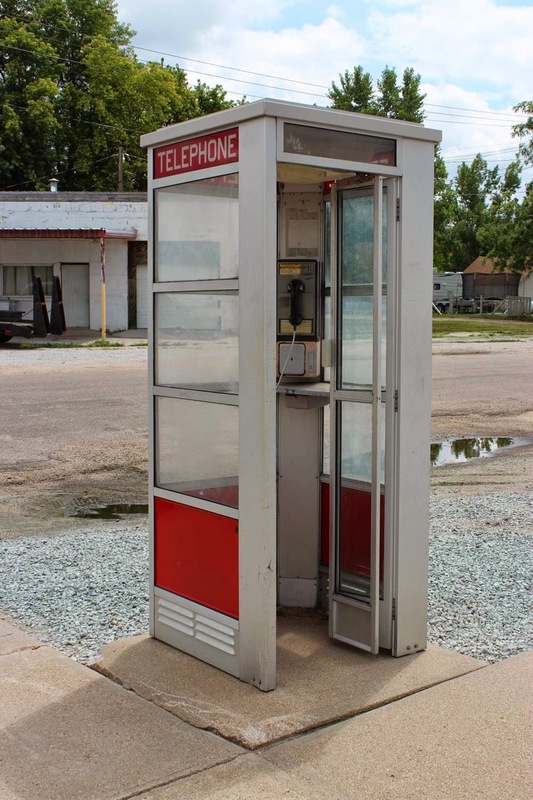 A blast from the past - a working telephone booth (we checked!). 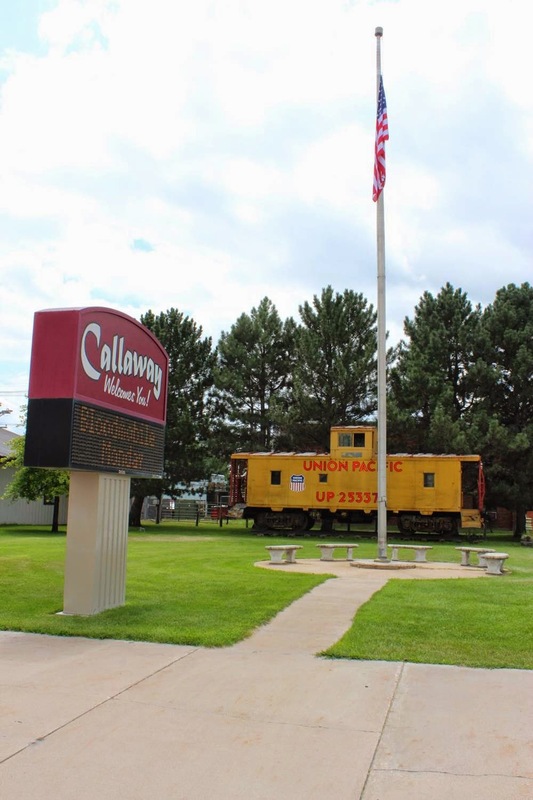 Callaway is a beautiful example of a vibrant small Nebraska small town, nestled in the scenic Nebraska Sandhills. It is well worth the visit. There is a small motel and nearby is Chesley's Lodge. 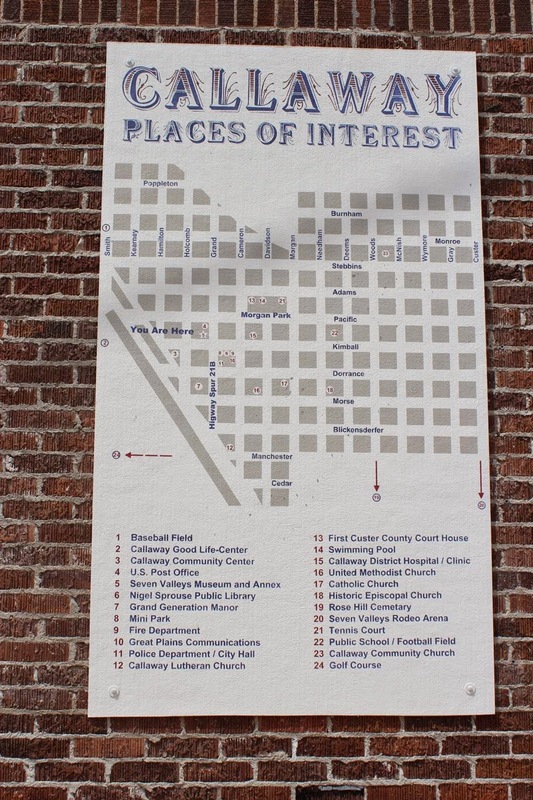 It looked as if there might be some hookups in the park, but we didn't investigate and I'm not finding anything listed online.